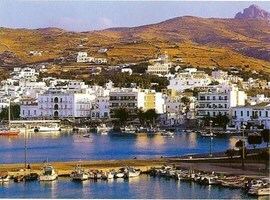 Tinos is the island of nature and of the friendly residents. This is the ideal destination for you if you’re not looking for crowded beaches and mass tourism. Tinos is ideal for those who sigh for the old way of living in an island, the authentic and unique picturesque streets and villages that the visitors look for on a Greek island and the delicious Greek cuisine that Greece is extremely famous for. 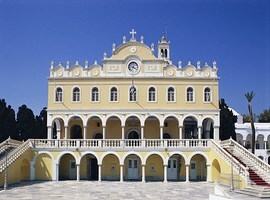 The island of Tinos is full of Greek visitors, during the summer months, who come here to pay homage to Holy Mary at the homonymous church of the island. Unfortunately many of them have not the opportunity to explore this beautiful place as they come only for a few hours or just for a night. 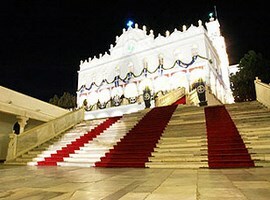 But if someone will decide to stay in Tinos, surely he will not be disappointed. The rest of the island waits unexplored while its beaches invite you to enjoy them. Also, the island offers a great variety of accommodation, with quality, comfortable and clean while the Greek hospitality and the wonderful landscape charm the visitors. Tinos is located in the northern part of the Cycladic complex and is a lovely island ideal for relaxing holidays, especially for families and couples. The beautiful beaches in Tinos are mainly calm and sandy while there is a good amount of tourist facilities for accommodation and eating. If you look for traditional atmosphere and picturesque architecture, you have to go to the central part of the island. Villages like Pyrgos which is the most characteristic village, have a rich marble carving tradition. Also, apart from a relaxing holiday island, the place is glorified by the Greek and foreign Orthodox pilgrims as it hosts the famous church of Holy Mary. The church of Megalochari (which means in Greek with all the graces) is dedicated to Holy Mary. 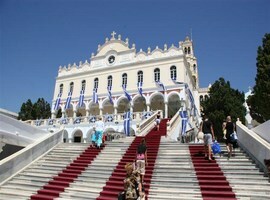 Holy Mary is the saint protector of the island and the church is actually dedicated to the Annunciation of Virgin Mary. That’s why, its second name is Evangelistria (which means announcing good news). Every year the church attracts thousands of pilgrims who the most of the times cover the distance from the port to the church on their knees, according to their promise, believing that in this way can be cured from different diseases or other sufferings. The church is located on a hill above the capital of Tinos which is named Chora and the path to it is very rough so the knees of the pilgrims can get injured. That’s why if you visit the island, you will see a long red carpet which starts from the port and leads to the church, especially for this purpose. The church is in fact a monastery complex and it was firstly built on the location of a Byzantine church which was dedicated to Saint John. Some excavations brought to the light that this specific location in antiquity was a temple for the ancient god Dionysus, so the complex is built on its remains. Finally, we can inform the future visitors that the church of Evangelistria has a celebration three times per year starting on January 30th, on March 25th which is the day of the Annunciation of Holy Mary and on August 15th, the day of the Assumption of Holy Mary. This day is the most celebrated in the entire Greek territory by the Orthodox people. Crowd of pilgrims and official people come to the island while the Hellenic Navy sends one of its ships to give a note of glory to the feast. Giannoulis Chalepas who lived from 1851 to 1938 is probably the most famous personality of the island of Tinos. He was one of the best marble sculpture artists, famous for his incredible works and his questionable way of life. Collapse was a real and a very talented artist. Nowadays, many young people from the island continue the tradition and learn the impressive art of sculpturing the marble. The traditional home of Giannoulis Chalepas has been formed today as a small and interesting museum according to the local style, accompanied by a beautiful garden. The museum hosts many personal items of the artist like his tools, bed, chairs, table and tools according to the style of the past century. In the museum are hosted many of the art pieces made by Chalepas until his death in 1938. Beautiful marble statues, pictures and personal archive are exhibited here. Also, very close to the museum, is located the marble workshop of Pyrgos. In the garden, you can see a statue made by the artist and a copy of one of his masterpieces; the Sleeping Girl which is the most famous work and grace the First Cemetery of Athens. The Sleeping Girl was made in 1878 and is a sleeping young girl, symbolizing the death. The island of Tinos is famous for its many interesting and strange designed dovecotes which are located here. They are two level fortresses like stone structures and are decorated with plenty of geometric patterns as triangles and rhomboids and with non-geometric patterns like pictures of the sun and coniferous trees. It is considered that these florid patterns make the lovely pigeons to come to these dovecotes. The most of the dovecotes are located in the central and eastern parts of the island while the oldest ones were built during the 18th and the 19th century. The Venetians first started the systematic breeding of pigeons when discovered that their meat had an excellent taste and their droppings were a high quality fertilizer for the ground and its cultivation. And this is true; the island of Tinos is one of the most fertile places in the entire Greek territory. The dovecotes are really unique pieces of art, very well preserved and it’s worth to visit them. Chora is the capital of the island of Tinos and the location of the famous church of Holy Mary that we have already mentioned and also the place where the largest part of the inhabitants live. It is a very picturesque town decorated with the local marble carving art and. A visitor here can find everything he asks for; many shops, souvenirs, modern art galleries full of paints made by local talented artists, old traditional houses and aromatic colourful gardens. Pyrgos is one of the largest villages of the island and hosts the marble sculpture school. That’s why in almost every place in the village you can admire marble masterpieces. Here are also the school of Fine arts and the famous wood carving workshops. The entire area of Pyrgos is an art museum; doubtless a unique scenery. 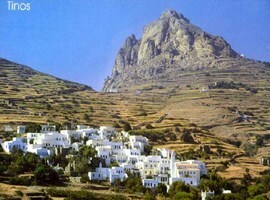 Dio Choria (means in Greek two villages) are among the most amazing places in Tinos. The villages are built amphitheatrically on the slopes of the mountain Exobourgo and keep the traditional Cycladic style; whitewashed houses with colourful shutters, stone paved streets and wonderful stone arches which create a romantic atmosphere. The characteristic of the villages is the colourful flowers which decorate every single point of the area. We may need thousands of words to describe all the beautiful villages of the island but is better to explore them by yourself! Some of them are briefly the villages of Fatalados, Arnados, Isternia, Kambos, Kardiani and many more others. 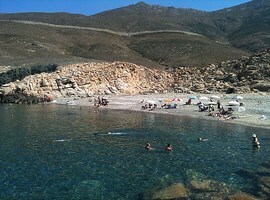 Agios Sostis beach is located 6km away from Chora in the southeastern part of Tinos. This beach is one of the most crowded and famous beaches of the island as it combines emerald crystal waters with a soft white sand and a beautiful scenery with plenty of trees to offer their cool shade during the warm days of the Greek summer. On the beach you can find a variety of taverns with fresh local dishes and a beach bar full of young people. Agios Romanos beach is located 6km in the northwestern part of Tinos. The beach is a long golden sand beach with cool crystal blue waters next to a beautiful tourist resort and settlement. On the entire surface of the coast are plenty of trees with their cool and rich shade. The beach has a clear view of the neighbouring island of Syros. Agios Fokas beach is in fact one of the largest and most beautiful beaches of Tinos. The beach is some kilometres long and those who choose it for swimming close can also enjoy a plenty of well developed tourist facilities as a snack-bar and many restaurants. This beach is ideal for those who want to feel safe as the swimmers are being observed by the experienced lifeguards. The largest part of the beach is unspoiled, not very crowded and it’s worth to visit it for its wonderful landscape and the soft sandy seabed which is offered for endless moments of swimming and funny sea games. Other beautiful beaches are indicatively the beaches of Kionia, Panormos, Kolimpithra, Agios Ioannis Porto, Isternia and Kalivia. You can access the islandby sea from the port of Piraeus and from the port of Rafina (on the northeastern part of Attica). If you choose a ferry, the trip will last for 2.5-4 hours. If you prefer a fast one, you will get to the island in 1.5 hours. By air, you can access Tinos through the airport of Mykonos and the trip lasts for 30 minutes.